After graduation, I decided to do some soul searching before settling into my first real adult job. Oh, the struggles of #adulting. I decided that Spain was my destination, so I filled up a backpack with 18 pounds of clothing and survival tools, booked my flight 7 days in advance, and got ready for a trip of a lifetime. Traveling around Spain, you stumble upon many small treasures, but sometimes you need to venture out of the major cities to find a hidden gem. I visited many cities while in Spain but, by far my favorite one was the small historic city of Toledo. Toledo sits on a hill above the plains of Castilla- La Mancha. Only about 45 miles from the capital, Toledo is the perfect day trip while staying in Madrid. UNESCO declared Toledo a World Heritage Site in 1986 for its extensive monumental and cultural heritage. Let’s travel back in time to this fantastic medieval city! PRO TIP: Arrive in the early morning and buy your ticket at the station. Since buses and trains depart every half hour, you don’t want to miss your departure time due to traffic. I arrived at the bus station, and our friendly Airbnb host picked us. If you don’t get lucky enough to have an excellent host like I did, don’t worry! It is only a short walk to the city walls. 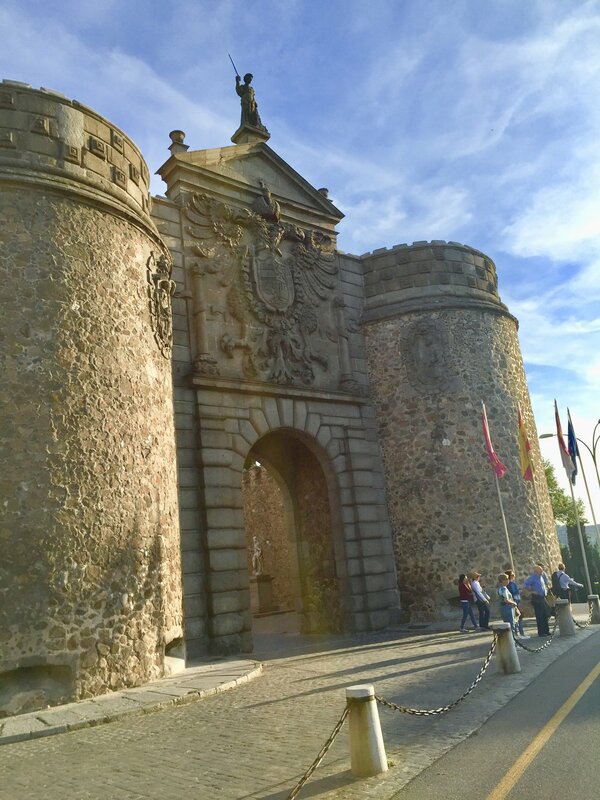 When you arrive at the city walls, you’ll enter the city through the Puerta Nueva de Bisagra. While in Toledo, make sure you take the trolley ride around the walls of the city. Visit Zocodover Square and purchase a trolley ticket at the small stand for about 5.50 euros. 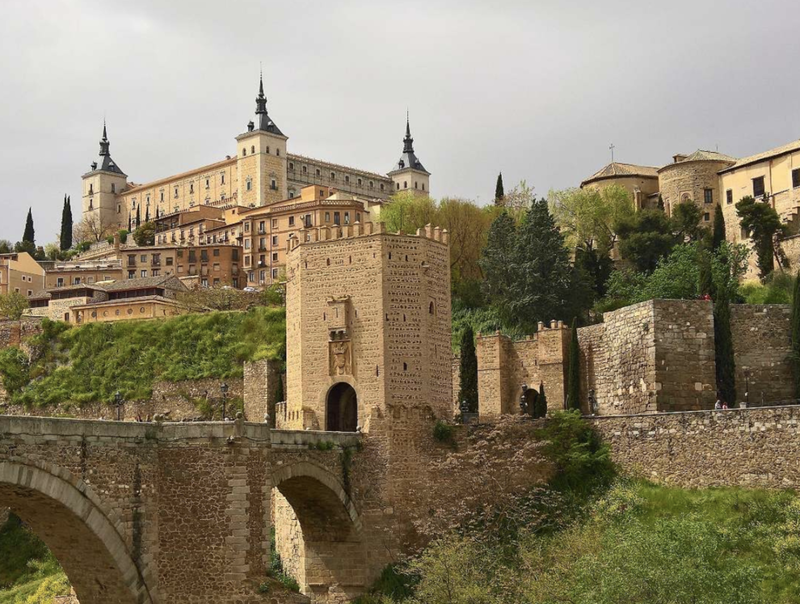 The tour lasts about 45 minutes and begins at Zocodover Square and winds through the city center to then circle the outer walls of Toledo. You’ll be able to appreciate the city from afar at one of the trolley’s stops, the Mirador del Valle. PRO TIP: Book your tour as sundown nears. This time of day will give you the best view of the city as the sun sets over the walls. 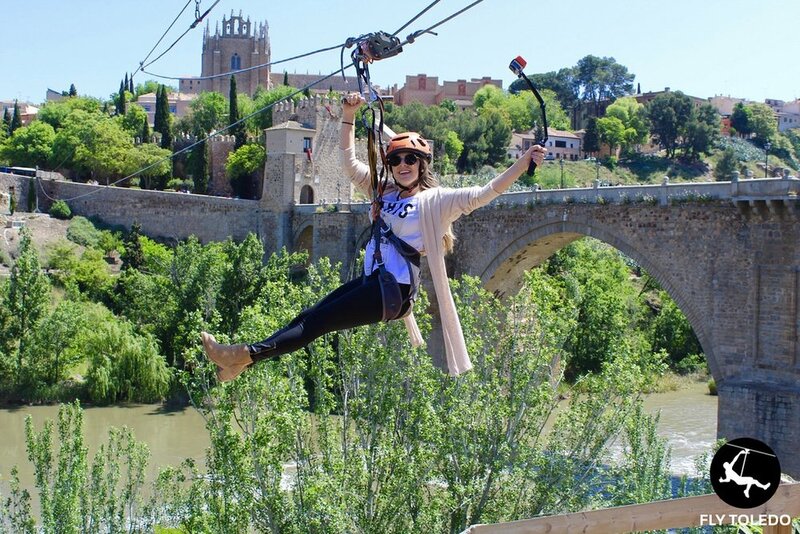 If you like some adventure, make your way to the Puente of San Martín. The reflective green waters of the Tagus River run through the bridge and look amazing from above while you zipline across the river! It costs about 10 euros, and for an additional 5 euros, you can get your picture taken. Visit Fly Toledo for more info. PRO TIP: They allow you to take your Go Pro with you. Make sure to put it on video mode and record your ride! If you opt for the picture, it is taken at the end so make sure to smile and pose as you near the end of the ride. The Roman, Moorish, Jewish and Christian influences can be seen throughout the city. The Cathedral of Toledo is one of Spain’s most beautiful cathedrals. This cathedral was built on top of a Moorish mosque - a must-see first attraction. Across from the Cathedral is the Ayuntamiento or Town Hall with a courtyard filled with colorful flowers and a small park. Initially a refuge for forces in 1963 during the Spanish Civil War, the Alcazar is now a museum and can be seen from outside the city walls. Are you a fan of Don Quixote? You can take the route as it is outlined in his novel. Visit the downstairs bar that has a classic old Spanish Taverna feel where you can order creative cocktails made by the mixologist. Then make your way upstairs to the modern sit-in restaurant. Food hall with options for everyone! Offers romantic tapas in a cave-like dining room. Make sure to make a reservation. Outside of the city walls, the restaurant was by far my favorite. You will find the typical plate with a Mediterranean twist. Craving craft beer? Head over for an authentic beer pub filled with locals. 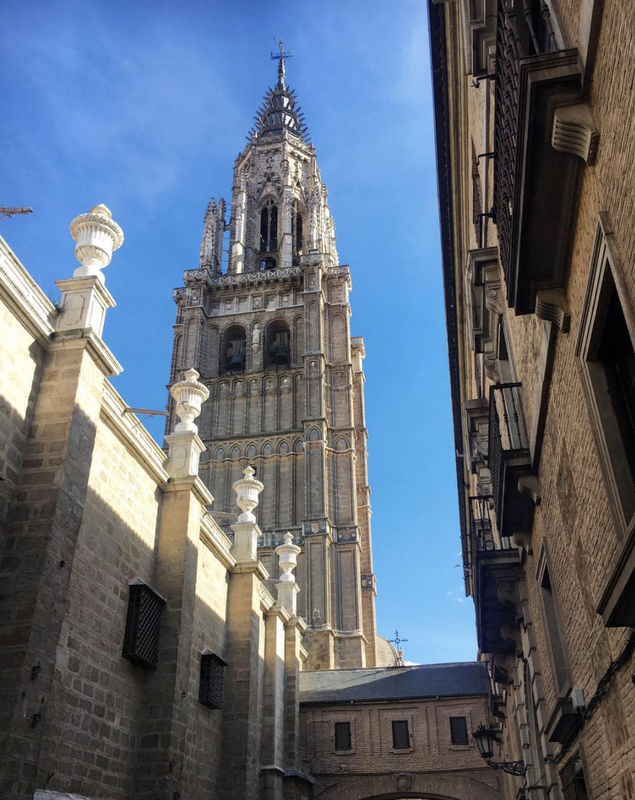 Toledo is a beautiful city, filled with rich culture and breathtaking architecture. Take time to stroll through the winding streets and admire all the "Puertas" of Toledo. What was your favorite part of Toledo? This blog post was written by Veronica from Millennial In Training. She is the Co-Creator of the blog and a serial-entrepreneur turned part-time blogger who helps millennials (like herself) take a hold of their lives, learn the ropes of #adulting, and make the most of their time while having fun! Disclosure: Please note that the links mentioned above are affiliate links, and at no additional cost to you, I earn a commission if you make a purchase. I use all the items I listed and I recommend them because they rock and have made my travel experience better.